What are some of the components of the social determinants of health? They include, certainly, housing, food, warmth, education, the overall treatment of women and especially the education of women. There is evidence that greatest determinant of the quality of a society, and especially its economic standing, is related to the education of women. Let us take the example of “food deserts”. 2.3 million (2.2%) of continental US households are more than a mile from a supermarket and do not have access to a vehicle. There are food deserts not far from me in Kansas City, KS. In a community called “the Argentine”, largely populated by Mexican Americans, it can take more than two hours on 3 buses to reach the supermarket. It could be faster to walk, but hard to carry back groceries. In fact, the inability to carry much on any one trip can lead to fresher food, but this requires availability of stores. In an article in the NY Times (July 31, 2011), Russell Shorto describes “The Dutch way: bicycles and fresh bread”; riding bicycles everywhere not only provides great exercise, but the limited carrying capacity means that the bread – and other food – is fresh daily. The unequal distribution of the social determinants of health is a major cause of health disparities, as demonstrated in the slides from Dr. Jones, and in a few from Dr. Woolf. The latter shows us a list of the 9 most common etiologies of death, from tobacco use (400,000 deaths per year) through illicit drugs (20,000, and not including the use of “licit”, legally prescribed, drugs). Seen this way, by root cause (that is “tobacco”, “diet and activity”, “alcohol”) as opposed to medical diagnosis (like “heart disease”, “cancer”, “liver disease”) we get a clearer picture of the true role of social determinants. Only one on the list, (#4, microbial agents) is even considered part of “traditional” medicine. Dr. Woolf also demonstrates the tremendous impact that education has on health with data from the University of California San Francisco (UCSF) Center for Health Disparities that show that 26.7% of those with less than a HS education describe themselves as having “fair” or “poor” health, compared with 5.8% of college graduates, a five-fold difference! The racial and gender difference in age-adjusted mortality rates is also dramatic; the death rate for black males is coming down, but still far exceeds white males and black and white females (and, although the rates for women are lower than for men, they are much higher for black women than for white women). 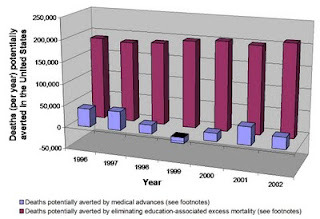 In a provocative “thought experiment” published in the American Journal of Public Health, “Giving everyone the health of the educated: an examination of whether social change would save more lives than medical advances”, Dr. Woolf and his colleagues demonstrate that even if we attribute all current and recent reduction in mortality to medical advances (nowhere near true; most are due to the types of societal change generally characterized as “public health”, such as clean water, sanitation, and cleaner air), eliminating the disparities that exist on the basis of educational level would dwarf that change, as shown in this graphic. The County Health Calculator produced by Woolf and colleagues from Virginia Commonwealth University, and available free on line, allows one to look at the socioeconomic status (measured as percent of people with income s >200% of poverty) and education (measured as percent of people with at least some college) for every state and county, and compare it to the other states or counties within a state. A neat “slider” feature allows you to change these rates (e.g., make the rate the same as the best or worst) and see what the change in deaths would be. For Harris County, Texas (Houston) , if 5% more people attended some college and 5% more had an income higher than twice the federal poverty level we could expect to save 1,200 lives, prevent 12,200 cases of diabetes, and eliminate $97.8 Million in diabetes costs every year. Although these areas are outside of traditional medicine, physicians can be involved in addressing them; they are (like Dr. Henry A. Withers, for whom this lecture is named) community leaders who have great moral authority. Bradley E et al, “Health and social services expenditures: associations with health outcomes”. BMJ Quality and Safety 2011 Oct 20(10):826-31.